one of the most intricate and extensive models ever made for Google Earth. 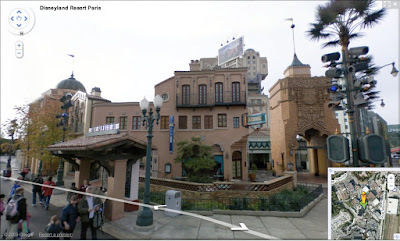 Now anyone can see Disneyland Paris in 3D and explore its streets and buildings in tremendous detail. While the model was under construction, though, we were thinking of ways to make the experience even richer. Street View is one of our newest and most exciting technologies and we are always looking for ways to new exciting places to add to the growing list of destinations. Together with Disney, we thought bringing Street View to Disneyland Paris would be a fun and innovative way to experience a place virtually. 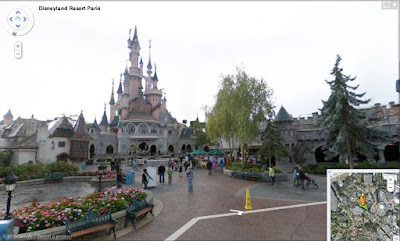 So, last October, as the last few rays of sunlight remained high enough in the sky, Disneyland Paris opened its gates early to our Street View car to capture some of the magic at street-level. We drove up Main Street USA (outside of Paris! 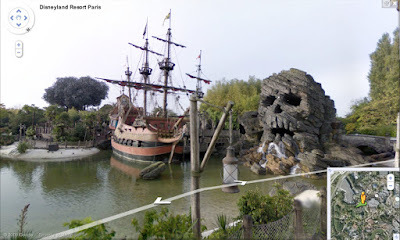 ), through Adventureland, and around Fantasyland and even in Walt Disney Studios Park. Some furry friends showed up early too. See if you can spot Buzz Lightyear, Pluto and Baloo, among others! Check out the mapplet we created to walk you through the park as well. Disneyland Paris was our first "special collection" in France, and we hope to capture more interesting and hard to reach places like race tracks, castles, parks and more. A couple of weeks ago, we were excited to announce one of the most intricate and extensive models ever made for Google Earth. Now anyone can see Disneyland Paris in 3D and explore its streets and buildings in tremendous detail. While the model was under construction, though, we were thinking of ways to make the experience even richer. Street View is one of our newest and most exciting technologies and we are always looking for ways to new exciting places to add to the growing list of destinations. Together with Disney, we thought bringing Street View to Disneyland Paris would be a fun and innovative way to experience a place virtually.